On Valentine's day, we drove down to San Jose to watch the quarterfinal of SAP Open. Min is so much in love with tennis these days that it was sort of my valentine's gift for him. My coworkers were also to join this valentine's celebration with Andy Roddick and Radek Stepanek. The quarterfinal were to start at 7pm, so we decided to have dinner before the game. I chose Gaesung House of Tofu because their foods are very authentic and I felt like having hot soft tofu soup on rainy day. 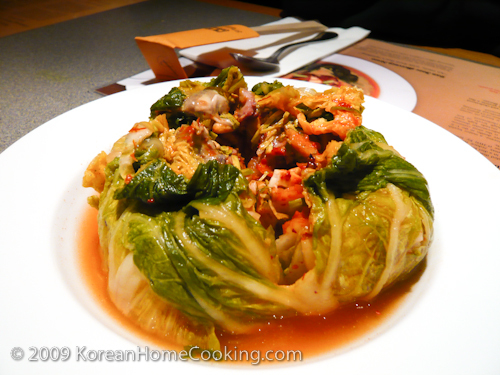 One of their specialty is the bossam kimchi, which means a wrapped kimchi as shown in the picture. It is a special kind of kimchi originated from the northern province of Korea. Each kimchi is meticulously wrapped with cabbage leaves and inside are shredded radish, Korean pear, dry dates, pine nuts, salted squid, oyster and many more. Their soups are very authentic, too. I had soft tofu soup and others had yookgaejang, spicy beef soup. All of them were very good. Sounds good!!! You're lucky to be close to so much great food. Thanks for the recommendations for the restaurant in the south bay. I've been looking for a place that serves good soft tofu soup - my favorite. I will have to visit this restaurant very soon.